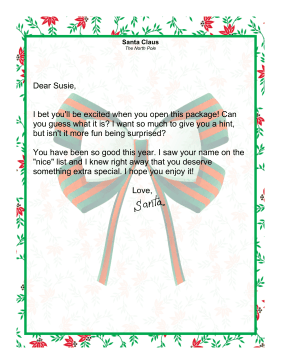 This short note from Santa is meant to be given along with a special gift, such as the toy the child wanted most for Christmas. I bet you'll be excited when you open this package! Can you guess what it is? I want so much to give you a hint, but isn't it more fun being surprised? You have been so good this year. I saw your name on the "nice" list and I knew right away that you deserve something extra special. I hope you enjoy it!